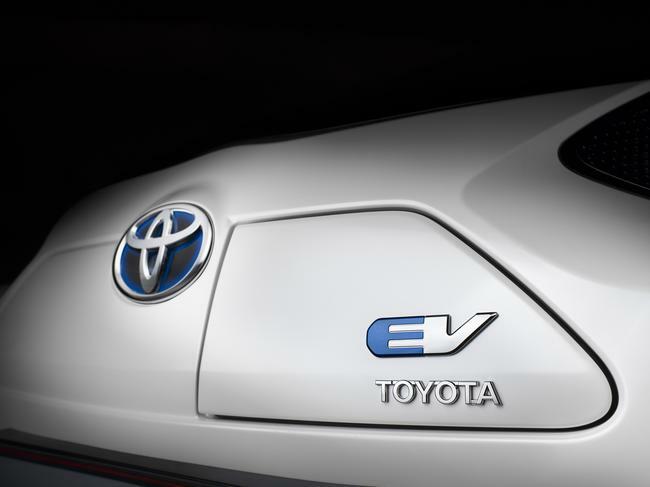 Toyota's engineers have been involved in Electric Vehicle (EV) research and development for over 40 years, since 1971. Developed in parallel with the company’s pioneering full Hybrid (HV), Plug-in Hybrid (PHEV) and Fuel Cell (FCV) vehicles, the EV represents Toyota’s long-term vision for short range sustainable mobility. The company’s readily adaptable Hybrid Synergy Drive® platform serves as the core technology for all of its advanced powertrain applications, based on specific usage patterns: EV for city driving, PHEV for city/mid distance use, HV for mid distance driving and FCV for long distance use. Key to EV development are the battery and motor control systems that Toyota has created and fine-tuned through the broad technological base of its hybrid vehicle programme. 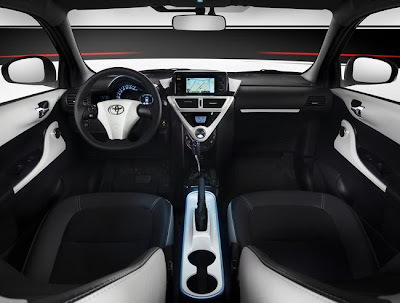 To date, Toyota has developed several types of EV, including a two-passenger concept- the e-com, an SUV- the RAV4 EV, and several FT-EV concept cars. First unveiled at the 1997 Tokyo Motor Show, the e-com shared much of its EV technology and powertrain components with the larger RAV4 EV. Producing zero emissions, it could run at speeds of up to 100 km/h for approximately 100 km on a single charge. By 2000, Toyota had a fleet of around 30 e-coms in use in Japan. By 1995, Toyota was already highly focused on bringing a viable electric vehicle to the market. Its first generation RAV4 EV represented the successful culmination of all the company had learned over the previous 24 years. Indeed, the first prototype won the Scandinavian Electric Car Rally in August of that year. The RAV4 EV had one of the best cruising ranges of any electric vehicle in the world –more than 120 miles (200 km) on a single charge. Since it was released in 1997, 1,500 were sold in the United States. A second generation RAV4 EV, created in partnership with Tesla, has recently been launched in the United States market. Three generations of FT-EV concept have been produced so far, making their respective world debuts at the Detroit Motor Show and the Tokyo Motor Shows of 2009 and 2011. 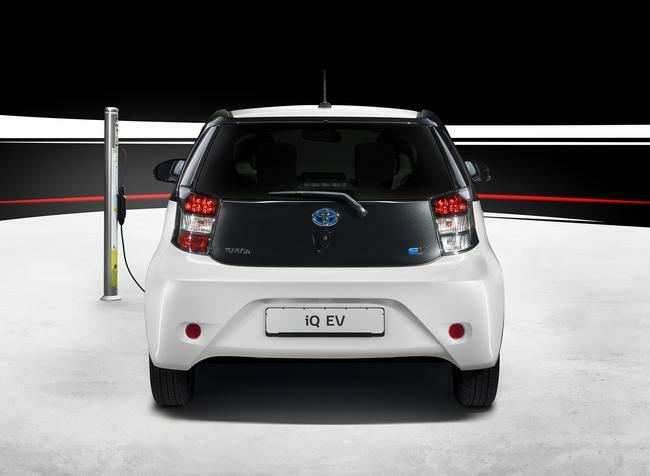 The iQ EV is a production version of those concepts, incorporating the technological and design strengths of all three models. It represents the installation of an all-electric powertrain within a Toyota iQ package, combining the ultimate in compact city car agility with zero emissions and the easy, silent driving of a fully electric vehicle for up to four passengers. The iQ EV has been specifically designed as a city commuting vehicle for use in an urban environment. In the interests of weight saving, packaging and charging times, that range had to be realised with the lowest practical battery capacity. Power efficiency therefore became the key development goal, focusing on a combination of lightweight design and the lowest possible power consumption. In an EV, the power consumption of the air conditioning system takes up a very high percentage of the total available battery power. To counteract this, the iQ EV features a low power consumption heat pump air conditioning system, allied to seat heater fitted as standard to directly warm occupants, and a new Heated Windscreen Defroster (HWD) system to clear the screen without the aid of the air conditioning system. A lower battery capacity also translates into a shorter charging time. 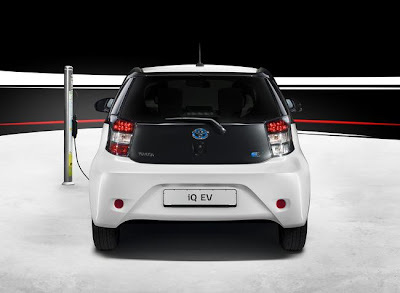 Not only can the iQ EV be fully recharged in approximately three hours, but also, via Fast Charging, its battery can be recharged up to 80% capacity in only 15 minutes, significantly enhancing the convenience and practicality of the new Toyota EV. At 3,120 mm overall, the new iQ EV is just 135 mm longer than a standard iQ,sharing the latter’s overall width of 1,680 mm, height of 1,505 mm and 2,000 mm wheelbase. A minimum turning circle of just 4.1 metres offers excellent urban manoeuvrability. Because the zero emission EV has no requirement for an exhaust system, the newly developed, flat, highly compact lithium-ion battery pack has been mounted within a high strength steel cradle beneath the cabin floor. This packaging solution has three key benefits: it offers no compromise to either loadspace or passenger accommodation for four; it equips the iQ EV with a low centre of gravity and ideal weight distribution for stability and urban agility; and it allows for the creation of an entirely flat vehicle underbody, maximising aerodynamic performance and, hence, power efficiency. High body rigidity not only improves vehicle stability and handling agility, it is also instrumental in the suppression of vibration. As a result, and in conjunction with extensive sound proofing throughout the bodyshell and cabin, the new iQ EV offers occupants the remarkably quiet exterior appropriate to an all-electric driving experience. Based on the FT-EV III concept shown at the 2011 Tokyo Motor Show, the new iQ EV exterior is hallmarked by unique styling details and the strong use of two-tone, White Pearl and Black colour to create a simple, bold design which instantly identifies the new Toyota as a highly advanced, all-electric evolution of the company’s renowned city car. To the front, a smooth, simple surface structure sees the removal of the upper grille and its replacement with a charging port lid to one side of the Toyota badge. The port lid itself has been positioned at the very front of the vehicle for maximum ease of charging cable connection within a wide range of urban parking scenarios. Adhering to the design principles of all latest generation Toyota vehicles, the lower bumper adopts trapezoidal, Under Priority character lines and an enlarged lower grille with a gloss black finish. The grille incorporates Daytime Running Lights (DRLs) to reinforce the new Toyota EV’s unique visual signature. A new headlamp design incorporates gloss black, side extension battery cooling air inlets, whilst the interior of the projector halogen headlamp housings has also been finished in black to further strengthen the EV’s visual differentiation from a standard iQ. To the side, the black upper surfaces of the two-tone colour scheme and the blacked out B pillar emphasise the new iQ EV’s sleek profile, whilst new, aluminium wheels with two-tone wheel caps reinforce the vehicle’s unique, all-electric credentials. The rear design features a black tailgate and a new, LED combination lamp design above a trapezoidal license plate mounting area within the bumper, both harmonising with the front Under Priority styling and reinforcing the iQ EV’s broad, stable stance. 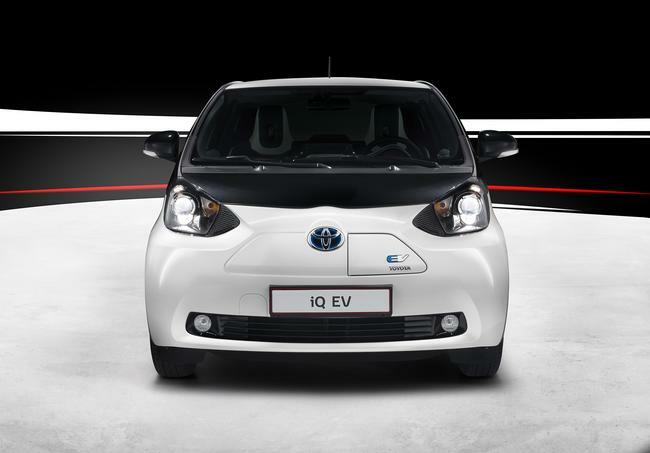 The iQ EV features numerous aerodynamic enhancements in the interests of maximising power efficiency. Grille openings have been reduced to a minimum and the bonnet upper surface shaped to optimise airflow over the front of the vehicle. The A pillar moulding width has been increased, the roof rear edge angled, and the rear pillar, quarter window glass and moulding shaped to help air flow separation over the top and sides of the vehicle. The front fender wheel opening has been aerodynamically shaped, front and rear wheel spats added in three locations and even the iQ EV-unique aluminium wheel cap design itself has been aerodynamically styled to optimise the flow of air down the sides of the vehicle, minimising turbulence. Comprehensive underbody covers allied to the underside of the battery pack create a flat underfloor surface, further enhancing the aerodynamic efficiency of the new Toyota. 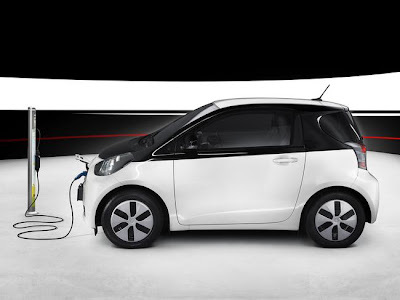 As with the exterior design, the iQ EV’s interior is finished in a bold, high contrast, black and white colour scheme. The meter hood, centre console, rear console upper surface, steering wheel horn pad, passenger side dashboard ornamentation and door trim grip and shoulder panels are all finished in white to reflect the vehicle’s uniquely clean, all-electric credentials. EV-unique, partial leather seat upholstery also features contrasting black and white finishes; the seat and headrest sides in white, central areas in a dark, plug-in-theme patterned fabric with bluish-grey and white stitching. Exclusive, premium-feel detailing includes light coloured accents to the rear console and door trim grip cover surrounds, the door handle itself, and the instrument binnacle hood. The iQ EV features an exclusive driver’s instrument binnacle with Optitron metres styled to resemble electrical componentry such as a generator turbine and printed circuitry. It incorporates a central speedometer with EV System Indicator-linked changing colour illumination, a 3.5” TFT (Thin Film Transistor) multi-information display, a compact, high contrast LCD (Liquid Crystal Display) and a plug-in indicator. The 3.5” TFT screen displays a comprehensive variety of vehicle information. Its easy-to-read default setting shows only the basic information the driver needs; driving range, state of charge and, through the EV System Indicator, output/regeneration status. In addition, the display may be switched through seven further screens; average/instant power consumption, post charge power consumption, electrical equipment usage information, driving range, total average vehicle speed/total driving time, EV battery information and settings. Located at the base of the centre console and finished in blue to match the ornamentation of the EV system start/stop button and shift knob, a further cluster of four, EV-related switches control the front and rear screen defrost functions, the charging timer start function and the charging port lid opener. Helping to maximise power efficiency, the iQ EV features a low power consumption, electric heat pump air conditioning system. The system has been designed to prioritise EV driving range. It is allied to front seat heaters -fitted as standard- to directly warm occupants, a windscreen-mounted humidity sensor to help the system control the internal/external air mixture to minimise screen fogging, and a new Heated Windscreen Defroster (HWD) system to clear the screen without the aid of the air conditioning system. Pressing a MAX mode switch activates maximum heating or cooling performance when required. The new Toyota EV is also equipped with a Remote Climate Control System. This allows the air conditioning to be remotely activated with the key when the vehicle is plugged in and charging. By reducing on board temperature extremes through remote activation of the system when the iQ EV is plugged in, air conditioning power consumption whilst driving is significantly reduced, extending driving range. In addition, the iQ EV benefits from a particularly generous standard equipment package, which includes a Smart Entry & Start System, a 6-speaker audio system and Hill Start Assist. Despite being the world’s smallest four-seater EV, the new iQ EV is a equipped with a comprehensive range of advanced safety features, including VSC and nine airbags; two front, two side, one driver’s knee, one passenger front seat cushion, two curtain shield and one rear window curtain shield airbags. The new Toyota iQ EV combines compact city car agility with zero emissions and the easy, silent driving style of a fully electric vehicle. Its small, 4.1 metre turning circle gives it excellent manoeuvrability in the urban environment, and the position of the battery pack beneath the vehicle floor creates a low centre of gravity and ideal front/rear weight distribution for excellent ride comfort and agile, engaging handling. A further development of Toyota’s Hybrid Synergy Drive® technology, the iQ EV’s fully electric powertrain comprises an air-cooled, 47 kW electric motor/generator, a 150 cell, a 12.0 kWh, 277.5 V battery pack, a 3 kW water-cooled battery charger, an inverter, an DC/DC converter and a motor speed reduction mechanism. The motor/generator, planetary gear speed reduction mechanism and torque biasing differential are all housed in a new, ultra-compact, EV-exclusive transaxle, which combines a low centre of gravity with reduced energy losses to minimise power consumption. Maximum torque of 163 Nm is delivered, from a standstill, to the front wheels, giving the iQ EV 0-100 km/h acceleration of 14.0 seconds and a maximum speed of 125 km/h. The new Toyota EV generates zero CO2, NOx or particulate emissions throughout its operation. With a power consumption of 134 Wh/km, this equips the vehicle with an NEDC-certified range of 85 km between charges. 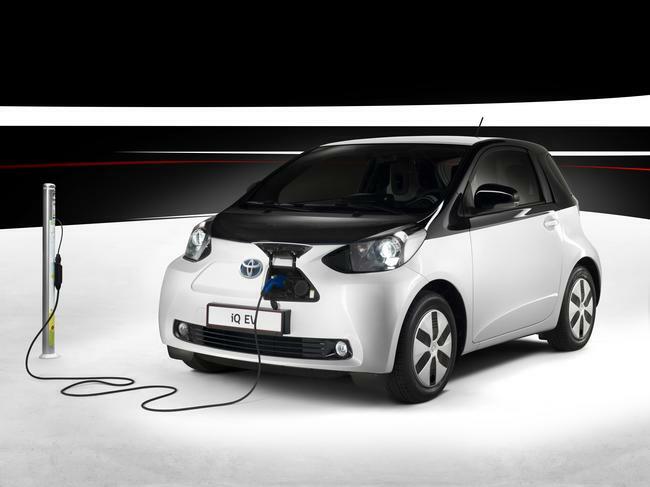 Similar to Toyota’s full hybrid vehicles, the iQ EV is equipped with a regenerative braking system. When decelerating with the accelerator pedal released, the rotation of the wheels is transmitted to the motor, which acts as a generator, converting kinetic energy into electricity for storage within the battery. When braking, the amount of energy that is recovered is determined through coordinated control with the electronically controlled brake system, optimising both braking force and energy recovery. The iQ EV’s gate-type gear shift lever offers drivers three driving ranges: D-range controls the vehicle to consume the least amount of power during city driving; S-range increases acceleration performance for brisk driving; and B-range maximises regenerative braking to extend the vehicle’s driving range as far as possible. In addition to the extensive system information provided by the EV System Indicator, an ECO Driving Indicator is also provided, helping drivers maximise the efficiency of the new Toyota EV’s all electric powertrain. Via an illuminated battery charger inlet conveniently located beneath a discreet, flush-mounted panel at the front of the new iQ EV, the battery pack can be fully recharged in approximately 3 hours from a standard, 230 V household outlet. A dedicated rapid charger compliant port is available as an option, enabling the battery to be 80% recharged in just 15 minutes, greatly enhancing the new Toyota EV’s everyday practicality. Two battery charger timer functions allow users to set either the start or the end time of battery charging. And a timer has been introduced to automatically match the charge completion time with duration of vehicle use, helping to reduce battery degradation. The 5 metre charging cable has been designed to remain flexible even in cold weather. It incorporates a CCID (Charging Circuit Interrupter Device) to automatically block the supply of AC current in the case of electrical leakage during charging. And the plug-cord may be detached from the CCID allowing it to be changed for compatibility with outlet shapes in various countries. The iQ EV has been specifically designed as an electric city commuting vehicle for use in an urban environment - the engineering programme is complete and iQ EV is ready for production. However Toyota has seen that many customers are not yet willing to compromise on range, and they don't like the time needed to re-charge the batteries. Moreover, the infrastructure for recharging has not become as widespread as originally anticipated. 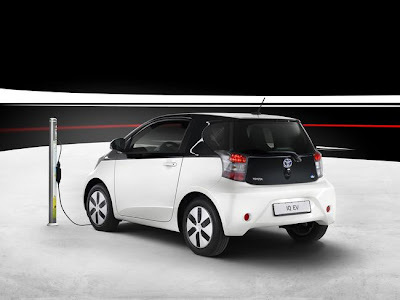 So, even though Toyota is ready with the iQ EV, we believe a plug-in hybrid solution offers a better way than pure electric for most customer needs in the short- to medium-term, and that is where we will concentrate our commercial activities. The Prius Plug-in Hybrid is a car that delivers the 25 kilometers of pure electric driving needed for 70% of Europe's daily journeys, and has the backup of an efficient hybrid system to deliver a range of over 1200 kilometers without recharging or refuelling.